give a fig | We got the beet(s)! These ruby reds (oranges and yellows, too) provide extraordinary antioxidant, anti-inflammatory and detoxification support for your body. 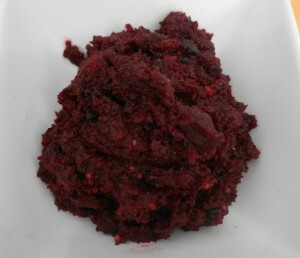 The red and yellow betalain pigments are what give the beet its rich colour and more importantly, its powerful health benefits. The nutritional properties of beets help protect against heart disease and certain cancers, notably colon cancer. Beets provide an excellent supply of folate, and are great sources of manganese, copper, potassium, vitamin C, and of course, dietary fiber. But enough of the healthy mumbo-jumbo. 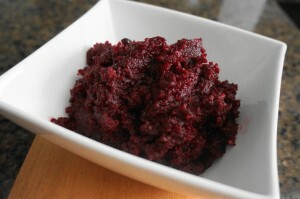 I must, must, must share this incredibly delicious Roasted Beet Dip recipe, courtesy of Tess Masters, The Blender Girl (healthyblenderrecipes.com). I know! I felt unsure, too. But Tess posted this recipe on her site and went on at length about how her beet-loathing friends took tentative first-tastes, and were completely won over. I served it for friends this past weekend…and they loved it, too! So, again, have a peek here. Haul out your food processor and start whirling. Note that the recipe calls for chopped fresh cilantro to stir into the finished product. I didn’t add cilantro, simply because it’s not my favourite herb. Follow your taste buds.